Development like character building, spiritual and moral values, physical growth, creativity and many more. GGPS has a very strong cultural component: there is a large Music room; Drama is offered as a subject and many successful productions have taken place in the GGPS Stage or our fully-equipped school hall; the Dance Society has many dancers; GGPS students are regularly selected for district lebel competition. Dance competition are held each year to showcase the work of our dancers and opportunities for dancing include assorted internal events as well as performances in local shows. The GGPS Music Department has six music teachers, specialising in piano, vocals, woodwinds, brass and guitar/bass. 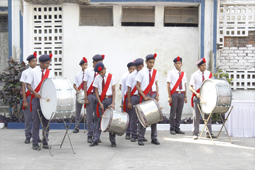 There are over 100 students taking Music as a subject. We have an active team taking part in the debating league, speaking contests and forum discussions, and Stirling is regarded as one of the best Debating schools. It gives the students an opportunity to develop particular skills and exhibit their non-academic abilities. These activities might be compulsory, such as music, art or drama classes that take place during the day. There is a proverb, “Teach me, and I will forget. Show me, and I might remember. Involve me, and I will never forget.” To a very great extent, the theoretical knowledge is enhanced when a co-curricular activity related to the content taught, is organized. To give all students the opportunity to be involved in culturally enriching activities. To give those students with special talents a chance to extend themselves and to grow in their area of expertise. Inter House Solo Song Competition was conducted in Multi-Purpose Hall in school premises. 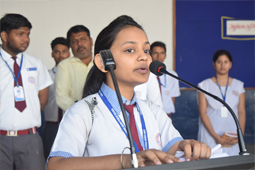 The theme for Class 4 and Class 5 was Devotional songs based on Radha-Krishna in which first position was secured by Kasfa Sanjari of Class 4/B(Dhart House). 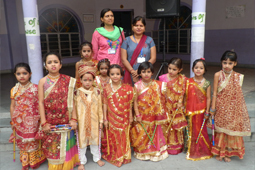 Shreya Singh of Class 5/B(Dhart House) was the first Runner-Up and Priyanshi of 4/C(Pawan House) was the Second Runner-Up. The theme of Class 6 & Class 7 was Folk Songs in which first position was secured by Krishna Tulsi of Class 7/B(Akash House). Rupayan of Class 6/D(Dhart House) was the first Runner-Up and Prachi of 7/B(Dhart House) was the Second Runner-Up. On the occasion of Guru Nanak JI’s 548th Birthday, Guru Parb with melodious shabad gayan by different houses of different shifts with great fervour and enthusiasm was celebrated in the School Premises.Shri S.P.Singh coordinator, GGES and Shri Laxman Mishra, Treasurer, GGES and Shri Jaswinder Singh Saluja were the guests of the programme. Guruparb was celebrated on 1.11.17 at GGPS Sec 2 in Gurudwara with a great fervour and enthusiasm. Children performed shabad and remembered Gurunank Devji and his contributions on his 548 birth anniversary.